In the modern era of computing, the end-user is often quite far removed from the machine they’re using. At least in terms of abstraction levels, the user experience of most computers, smart phones, and the like are very far away from the zeros and ones. If you need to get down to that level though, you’ll have to make your way to a terminal somehow, and reminisce fondly about the days when everything was accessed through a serial line. Nowadays, some harmless nostalgia is often accompanied by a challenge as well, as [Nick] demonstrated with his tiny serial terminal. It mimics the parsing and rendering of a VT100 console using an Arduino Uno and a 1″x1″ TFT screen. His goal was to make it wearable like a wristwatch would be, using two buttons as an HID device. With the size and simple interface, [Nick] also explores the possibility of mounting such a terminal to a pair of glasses. While not everyone may want to interact with a serial terminal with only two buttons, it’s certainly a great demonstration of what is possible when it comes to implementing retro software in unique ways. There have been serial terminals implemented in many other unique places as well, such as old oscilloscopes and replicas from popular video games. There’s a car race going on right now, but it’s not on any sort of race track. There’s a number of companies vying to get their prototype on the road first. [Anurag] has already completed the task, however, except his car and road are functional models. While his car isn’t quite as involved as the Google self driving car, and it doesn’t have to deal with pedestrians and other active obstacles, it does use a computer and various sensors to make decisions about how to drive. A Raspberry Pi 2 takes the wheel in this build, taking input from a Pi camera and an ultrasonic distance sensor. The Pi communicates to another computer over WiFi, where a neural network operates to make decisions about how to drive the car. It also makes decisions based on a database of pictures of the track, so it has a point of reference to go by. The video of the car in action is worth a look. It’s not perfect, but it’s quite an accomplishment for this type of project. The possibility that self-driving car models could drive around model sets like model railroad hobbyists create is intriguing. Of course, this isn’t [Anurag]’s first lap around the block. He’s already been featured for building a car that can drive based on hand gestures. We’re looking forward to when he can collide with model busses. There has been a recent trend in miniaturizing embedded platforms. [Jan] wrote in to tell us about his very tiny ARM based embedded platform, the Catweazle Mini. Who knew that an ARM based system could be so simple and so small?!? With the success of the Trinket and Femtoduino (miniature Arduino compatible boards) and many other KickStarter campaigns, it is only natural for there to be a mini platform based on the ARM architecture. 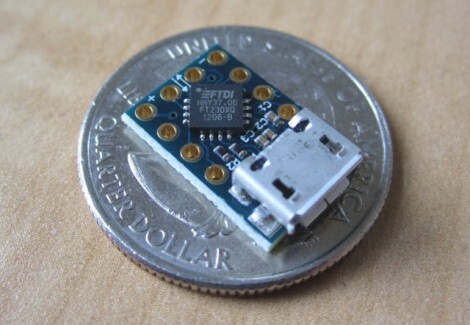 Built around the NXP LPC810 ARM Cortex M0+ MCU at 30MHz (which only costs slightly more than $1, by the way), this small embedded platform packs some pretty impressive processing power. The board contains a simple linear regulator, and can be programmed via UART. [Jan’s] development environment of choice is the mbed compiler, which is free and requires no installation. If you need some help getting started Adafruit has a nice guide for the LPC810. Do you need some more processing power for your next wearable project? Be sure to use the Catweazle Mini. Using FTDI chips as a USB to Serial solution is nothing new, but this MicroFTX board takes the footprint to a new low. If you’re space limited this should have no problem fitting into your project. But if you plan to use it for prototyping we predict it’ll be lost in the parts bin forever as soon as you take your eyes off of it. The USB Mini-B connector is becoming quite popular with hobby electronics these days. But here [Jim Paris] chose to use its little brother, the USB micro connector. Want to put this together by hand? How are you with 0402 footprints and QFN chips? In fact, there’s a ground pad on the bottom of that IC which means you really need to use a reflow oven to do the job right. Aside from the diy-unfriendly fabrication size, we do like the design. There are four output pins (voltage, ground, TX, and RX) with a set of four solder jumpers to configure them. It can be powered from the USB port or an external connection, with the option for 5V or 3.3V output.